Turn your bathroom into a beautiful spa retreat with tile, stone, and other fixtures from Herr's Tile & Marble Co. Our expert team will help you select the perfect materials, including vanities, vanity cabinetry, shower doors, and bathroom fixtures. We handle all installations personally, with a thorough attention to detail. We have access to various bathroom accessories to make your bathroom accessible in the future. 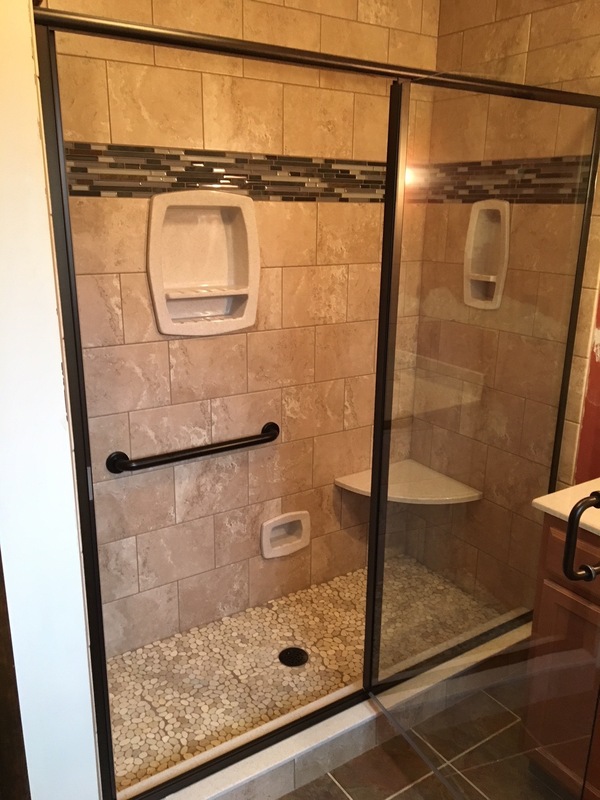 Ask us about handicap accessible showers, as well as shower seats and grab bars for ease of transition. We install custom features for your specific needs. We offer custom 3/8 in. frameless glass and BASCO shower doors and custom shower bases. Herr's Tile & Marble Co. offers only the best materials. In our showroom you'll find a range of porcelain and ceramic bathroom tiles, and a variety of textures and colors. We also have fixture catalogs from top brands to make your selections; such as Kohler, Moen, Delta, Blanco, and more! We are a family proudly servicing our Chambersburg community and surrounding areas. Let us create a one of a kind shower for you! Our team is passionate about tile! Tile can be a subtle touch or a brilliant splash of color in your bathroom. Whether you're adding a back splash behind the vanity, redoing your shower, bathtub surround or a custom tile installation. Herr's Tile & Marble Co. will turn your room into a unique work of art! In your bathroom, tile is the perfect material for your shower walls. It's beautiful, durable, easy to clean, and easy to customize. We offer Custom show bases, shower seats, grab bars and recessed niche to complete any shower. Some grouts are a new generation with added benefits: stain resistant, flexible and color consistency. We always go the extra mile to make our customers happy because we want you to be fully satisfied with the service you receive from us. For more than 30 years we've served our community by offering expert estimates and installations. Contact us today to learn more about our services, or visit our showroom to view our latest offerings.